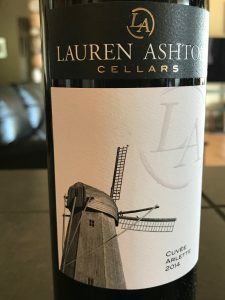 Another Great Release from Lauren Ashton Cellars - Write for Wine: It's Wine O'Clock Somewhere!Write for Wine: It's Wine O'Clock Somewhere! Regular readers know that we are big fans of Lauren Ashton Cellars. There is a simple reason — Kit Singh makes great wine. His motto, “True Washington Character,” is evident in every sip we’ve tasted. His wines are also known as “friendly” and “iconic.” All three descriptions are showcased in his two recent releases, which we were fortunate enough to sample, courtesy of the winery: 2014 Cuvée Arlette and 2016 Roussanne. We have loved every vintage of this beautiful, elegant red wine, and this year’s stellar release is a stunning follow-up to the 2013. Cuvée Arlette is a rich and complex right-bank Bordeaux blend of Merlot (57.5%), Cabernet Franc (25%) and Malbec (17%), rounded off with a splash of Petit Verdot (0.5%). The Malbec replaces the Cabernet Sauvignon in the 2013 vintage, resulting in a layered, luxurious and structured wine with notes of red and dark fruit, cocoa and caramel, and hints of spiciness. Pair this beauty with steak, grilled meats, pork or lamb dishes. As with any new release, the wine is still young, but very approachable with decanting. Roussanne is native to the Rhone region of France, and only a few Washington state wineries are producing it. 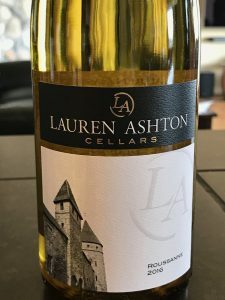 Lauren Ashton’s 2016 elegant release offers a beautiful nose of lemon, honeysuckle and herb, leading to a medium body with flavors of stone fruits such as peaches and nectarines, in addition to apples and pears. There’s also a hint of minerality because of its fermentation in a combination of stainless steel, new French oak and neutral oak. Pair this white wine with halibut, chicken, lobster or scallops. As we’ve said in the past, we highly recommend stopping by Lauren Ashton Cellars Tasting Studio in the Hollywood District of Woodinville. This entry was posted in Bordeaux Blend, Cabernet Franc, Columbia Valley, Malbec, Merlot, Petit Verdot, Roussanne, Washington, Wine, Woodinville and tagged Bordeaux Blends, Cuvée Arlette, Lauren Ashton Cellars, Roussanne, Woodinville by Margot. Bookmark the permalink.